THIS IS OUTDATED. THE ISSUES WHICH THIS WAS MEANT TO FIX HAVE BEEN ADDED INTO THE GAME. GO PLAY THAT INSTEAD. There has been a lot of confusion about what Collectivist and Individualist mean. They were stated not to be representative of any particular ideology. To clear up the confusion is this mod, which changes Collectivist and Individualist to be Hierarchical and Egalitarian. 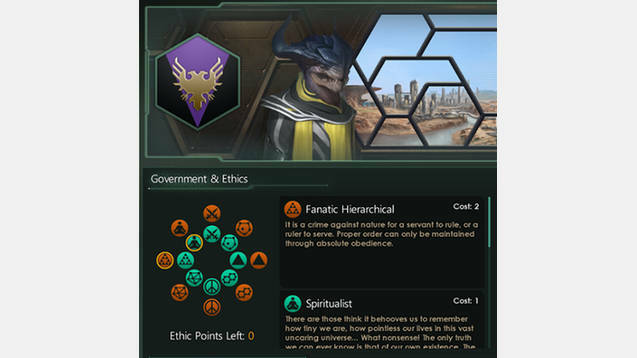 Currently, it contains replacement localization for the ethos and descriptions, along with some of the buildings and techs, notably the Galactic Stock Exchange Hyper-Entertainment Forum, and a few of the specialized colony techs. I have also changed most of the opinion modifiers and diplomatic messages. Later, I plan to change the rest of the special techs, buildings, etc. to make more sense. Currently, it should be compatible with anything that doesn’t also change the localization strings I’ve changed.